To cool down, simply place in your freezer and allow to cool – normally charged in only 2 hours! Stays hot or cold for up to 2 hours! The cool packs are used for minor injuries and work well. I use it as a cold gel pack to relieve knee pain. Probably recommend tomy relatives. Very good quality. I use the product to ease pain in my hip, due to an accident many years ago. I would recommend this product to anyone with aches and pains as it is non invasive and works! Nice sturdy pack. I use it on my back when the muscles become inflamed. I put it in the freezer and just take it out when required. I would recommend this product to anyone with joint, muscle issues. The quality is high standard. In a sleeve given to me at the hospital after a total knee replacement. Recommended to family & friends. For the price quality good. Easy to use. I have a badly sprained ankle and was advised to treat it with ice pack. The reuseable gel pack was recommended by a family friend. It's a brilliant product that has helped with my recovery. It's so convenient and easy to use without creating any mess you get using ice cubes. Put it in the freezer for a couple of hours and then apply to injured area. Replace back in freezer to re-use again. Can also be used as a hot pack but I have not used it in this way as yet! Would highly recommend this to anyone who is advised to apply cold packs to an injury. I am using these to make weight blankets for a child with SPD. I use the ice packs as I have a trapped nerve in my back and spend quite some time each week in hotels where a freezer is not always available for reuseable packs. These work well. Speedy delivery. Quality as described product. Enough said. To control bleeding or swelling after injury. Product fine. To control bleeding or swelling after injury. I use it as a cold compress for arthritis and back pain. I would recommend the pack to anyone suffering from the above. Used for first aid treatment with children. Excellent ! . for the BRUISED elbow i recently suffered after a heavy FALL. Great product, ordered two pack of large ice packs to use following abdominal surgery. They are great value and arrived well packaged in good time. We use it for helping areas of the body which are causing discomfort. Anyone who has such a problem will certainly benefit when applied several times a day. The quality is good, a protective fabric sleeve would be useful. Arrived safely & as described. Good service & product. I use the product to reduce swelling in a muscle problem. In the freezer for after training and football matches. Used for muscles strains in various areas. These pads help with her Rheumatoid arthritis. I use the product in my clinic for pain relief on treatments we do. I give them free to clients after their treatment as good customer service. I have recommended you to other who have a similar business. I use the ice packs on my arthritic joints to alleviate my pain. 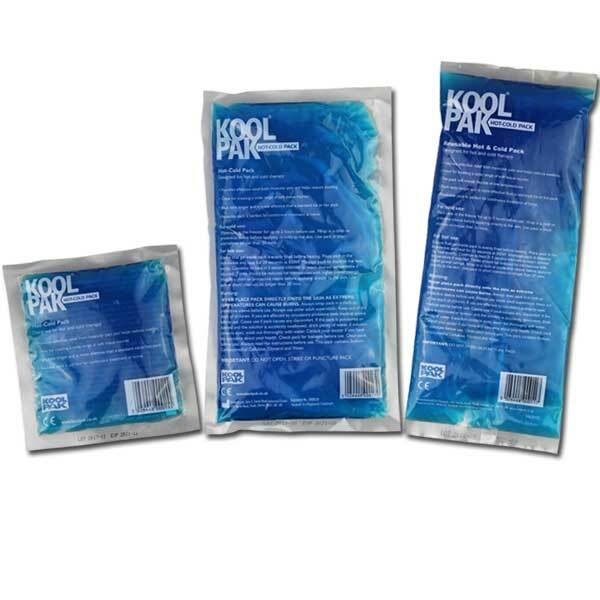 Kool pack is sitting in the freezer compartment of the milk fridge in a marked envelope, waiting for the first First Aid incident requiring a cold or hot compress. Superb value! Good size of gel pack. Perfect for wrapping round ankle or knee. Can be used hot or cold. Pack made of high quality outer. I use mine for back pain, my husband for knee pain. My pain responds to heat, my husbands to cold. Would reccomend cold use but not hot, as not very robust. excellent product, does what is says on the tin ! This Gel Pack is for a sports injury and is used as a flexible ice pack. It has the right amount of filling to make it really useful. I needed this product for my husbands bad neck and it was not supple enough for comfort. Probably best for bad knees.